Soaring is a large sculpture composed of two "bird" forms performing an intricate dance of swoops and glides. One bird soars through a large six-foot diameter circle at various speeds while the other proscribes a random pattern of ellipses within the larger circle. Elegantly elongated forms create visual poetry of spacious movement played out over time. The dance is constantly changing but remains fluid and stately throughout. The motion in Soaring is driven by a double constant force spring mechanism that uses two winding wheels and a system of pulleys to deliver the energy to the small random escapement mechanism. 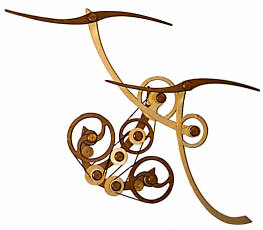 Like many of my longer running sculptures this piece only gets a "push" when it runs out of energy and needs one.